Nothing embodies the spirit of the true Italian-American tradition in the US more than our country’s Italian-owned restaurants. There is a general warmth, familiarity and good, authentic cooking that fills each of these establishments- it’s unmistakanle. Baci in San Diego, is no exception. Thanks to Brittany Carlisi, who introduced me to this old-school Italian standard, Baci is one of my favorite places to meet up with a colleague for lunch. The waitstaff has been there for years, and the chef clearly loves what he’s doing, as evidenced in the ingredient-driven food, and honest, well-executed dishes. In fact, we can’t start a meal without ordering a simple appetizer of local Ricci di Mare (Sea Urchin), served simply alongside a bit of garlicky toast. The chef also uses this delicate and super-fresh shellfish in a simple spaghetti- nothing more than salt, pepper, garlic and the freshest sea urchin La Jolla’s coastline has to offer. Bravo! What to pair with such ocean-fresh salinity? A wine with a mineral backbone to match- not to mention a searing acidity that will highlight the rich, creamy texture of the ricci. We loved both dishes with Cottanera’s “Barbazzale Bianco”, a fresh, zippy young wine made with Insolia grapes from the Etna area in Sicilia. 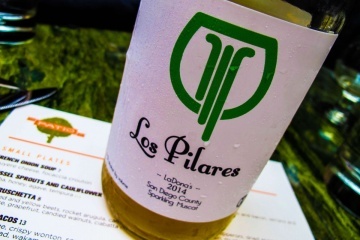 This wine is stainless-steel fermented, lively and full of energetic green fruit. It has a salty edge that compliments seafood dishes, and an underlying volcanic minerality that keeps everything interesting. Bäco Mercat: Where it’s Hip to be a Carnivore. Finally. On the Relationship Between an Italian and His Seat Belt. I like to think that I am an adventurous eater, but the sea urchin looks very intimidating! Is it cooked? Is it soft and spreadable? Is it salty? I am very curious about this interesting treat from the sea.